For many cancer patients, going through radiation therapy can be an incredibly stressful and time-consuming process. 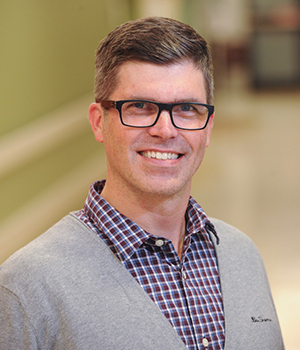 Dalhousie’s Dr. James Robar wants to change that by providing health practitioners with an in-house tool that improves the accuracy and efficiency of this treatment, while making it a more comfortable experience for the patient. Radiation oncologists and medical physicists have access to high tech equipment, state-of-the-art software and linear accelerators to deliver treatment in a highly automated way, but there are key steps of the process that remain very manual. These include using a device called a bolus, which is a layer of tissue-equivalent material placed on the patient’s skin during treatment that assists in providing the optimal dose of radiation. Currently, the bolus is generally made out of a rubbery material called SuperFlab. Although this has been the industry standard for decades, it does have some drawbacks. To get around this, radiation therapists often have to use decidedly lower tech materials like wax, linens and tape to make it fit as well as possible. Dr. Robar was determined to find a better way, and with 3D printing becoming increasingly more accessible, he saw an opportunity, starting in 2012. By using existing CT images that are acquired for patients as a part of standard procedure and a 3D printer, he figured that he could create devices for that were tailored to fit each specific patient accurately. With a Proof-Of-Concept (POC) grant from Springboard Atlantic, Dr. Robar and his team purchased their first 3D printer, and began creating four different devices. The linear accelerator also produces electron beams, which are used to treat tumours closer to the surface of the patient. Dr. Robar’s team developed novel algorithms that produce a 3D printed bolus that will modulate the energy of the electron beam, tailoring the treatment to the patient. 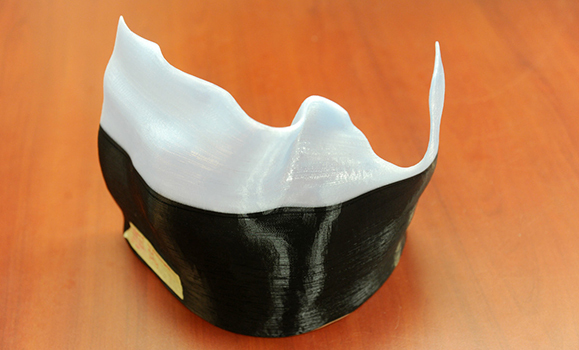 This was the very first 3D printed device that Dr. Robar’s team created. One of his students in the Dal Medical Physics Graduate Program, Shiqin Su, was responsible for developing the algorithm. The x-ray photons used in radiation therapy are approximately 100 times more energetic than x-rays used in imaging, and are designed to kill cancer cells. One application of 3D printed photon bolus is used during treatment of the chest wall for patients who have received mastectomy. An adequate radiation dose must be delivered to the surface of the chest wall, and Dr. Robar’s team has recently completed an in-house study to evaluate the new technology for that indication. With that information, Dr. Robar was able to look through the image archival system, and pull his CT scan to design a bolus which fit perfectly in his nose before he even stepped foot in the clinic. The next application is an immobilization device, which was specifically designed for breast cancer treatment for an intact breast. Usually, this treatment is administered over 16 to 25 weekdays in a row. With breasts being highly mobile, it can cause an inconsistent dose of radiation to be delivered over this period of time. The idea was to create a bolus that would act like a shell, and use a highly stiff version of 3D printing materials to keep the breast in place. The capacity to create a complex but hollow structure that is tailored to the patient is a unique feature of 3D printing, and by using this technology to minimize the amount of material in the path of the beam, it limits the skin dose and the associated severe toxicity. Brachy therapy treats tumors on both the inside and the surface of the patients by delivering radiation to the tumor through a radioactive source. Currently, an accessory called the “Freiburg Flap” is used for treating tumours near the surface of the patient. It consists of a beaded sheet that must be manually affixed to the patient, for example, by sewing to a mask or cast. Catheters pass through these beads, which allows the application of a radioactive source to treat a tumour on the patient. The downfall of the Freiburg flap is that practitioners have to try and force the blanket of beads to conform to the anatomy. This is not an easy task, and Dr. Mammo Yewondwossen, also on the Medical Physics team, thought that this process could be improved by 3D printing a custom applicator. Another Dal Medical Physics Graduate Student student, Scott Clarke, helped develop the technology for this particular device. All of these applications have been shown to greatly enhance the accuracy and efficiency of the radiation treatment process. The next step is to put it in the hands of clinicians. The 3D printing technology was licensed over 18 months ago from Dalhousie’s Industry Liaison and Innovation, and from there a start-up company called 3D Bolus was formed to begin developing the product. The product includes the software that will enable practitioners to create photon and electron boluses, low-density immobilization and brachytherapy surface applicators. The application is bundled with a 3D printer. Currently version one of the product has been developed and has secured CE Mark clearance. The technology has been deployed in clinics in Dublin, Ireland and Tel-Aviv, with research versions in Chicago, San Francisco and Halifax. Going forward, the company’s approach will be to bring in 10 founding clients who will be the first in the world to use the technology in the clinic and to assist with testing and further development. Once they receive Food and Drug Association (FDA) clearance, slated for early 2018, they will begin sales in the US. To learn more about collaborations with Dalhousie University on innovative projects, contact Industry Liaison & Innovation and for more information about the 3D Bolus visit their website.